For the basic cookie here I used one of my standard gluten-free, vegan, and refined sugar-free cut-out cookie recipe that lends itself well for cut-outs and stamping. 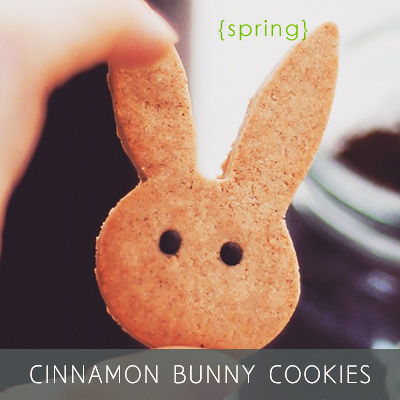 I flavored it with cinnamon this time and I think it’ll be my favorite way to enjoy these cookies from here on — so good and somehow makes perfect sense to me with the cute bunny theme. 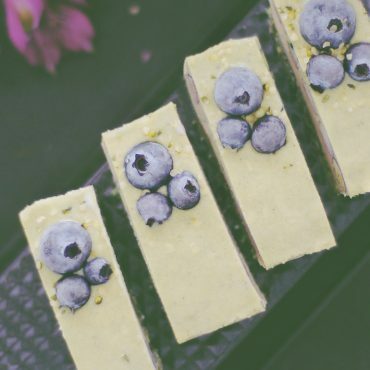 If you like the concept of these cookies, but prefer an oil-free cookie base to work with, you can always use this cashew butter tea biscuits recipe instead — it’s another one that lends itself well to stamping. For the cookies here I made 2 batches. 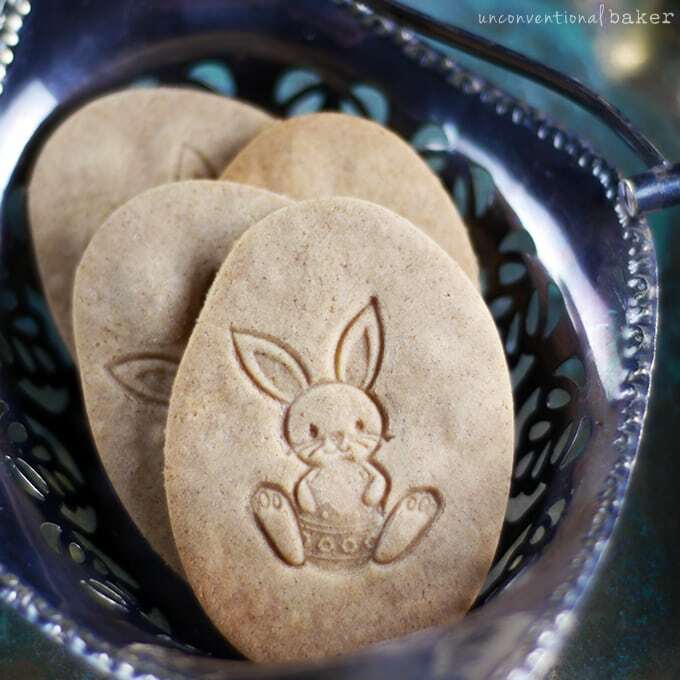 One was egg-shaped (using a simple egg-shaped cookie cutter) and stamped with a bunny stamp which I got at an art supply store (Michaels) — you can read more about stamping cookies, where to find stamps, and other tips or tricks, here. The other batch, which was my personal fave, involved a simple bunny face cookie cutter I found at a local shop and some chocolate covered amaranth balls for eyes. Little chocolate chips or dried currents would work quite well too. Or decorate the ready cookies with some melted chocolate dots if you prefer. 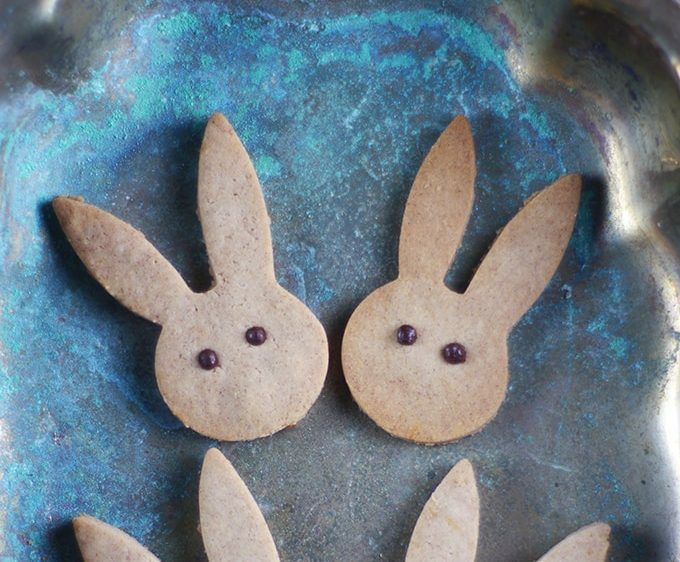 Delicate gluten-free, vegan, refined-sugar free cinnamon cut-out cookies. Preheat oven to 350F. Line a cookie sheet with parchment paper. Prepare a rolling area with two additional sheets of parchment paper for that, and have your cookie cutter(s) handy. Set aside. Place the coconut oil or butter in a large mixing bowl and whip it with a mixer to soften it a bit. Add sweetener, vanilla extract, cinnamon, and salt and mix once again to combine. Add in flour and use a wooden spoon to mix. Then get in there with your hands and mix everything together by working the dough until you can shape it into a ball (note: as depending on the flour mix you use there may be a slight variance, know that the consistency of the dough should not be sticky but should press together when pinched — be sure to knead it really well first for some time — if it’s a little too sticky, add a little more flour (try 1-2 tbsp); if it’s a little dry add a little more sweetener (try 1 tbsp)). Shape the dough into a ball and then flatten into a disk. Roll out one of the dough ball between two sheets of parchment paper to ¼” thickness. Use a cookie cutter to cut out the circles. Carefully transfer to a prepared cookie sheet, spacing them ½” apart (they won’t spread as they bake). Gather up any dough scraps and repeat until all dough is used up. 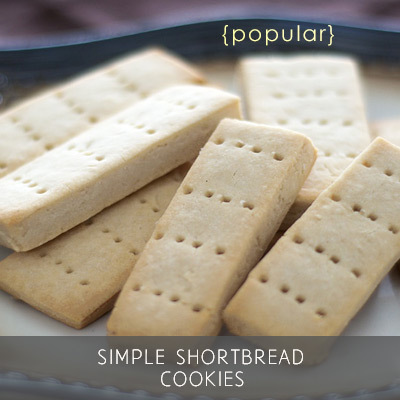 If you’re doing the cookie stamp version, carefully stamp the cookies when they are on the cookie sheet. 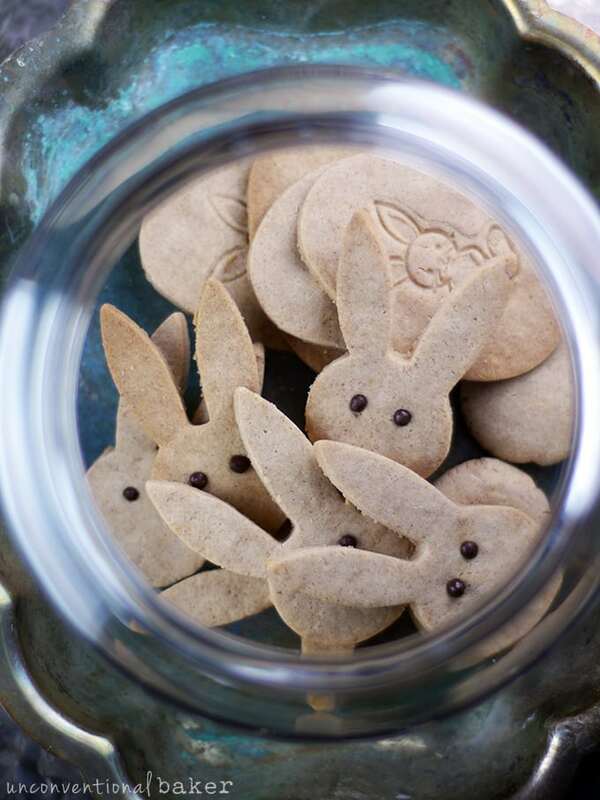 If you’re going with the bunny + eyes option, set the “eyes” (the amaranth balls or whatever you are using) and any other decoration onto the cookies now (note: the “eyes” need to be pressed in lightly into the cookie). Bake in a pre-heated oven for approximately 11-13 minutes, until the edges just begin to become golden (time will vary depending on your cookie size). Remove from oven and place on a cooling rack. (Note: cookies will harden a little within minutes of cooling, so don’t overbake). Allow the cookies to cool for 10 minutes and enjoy! 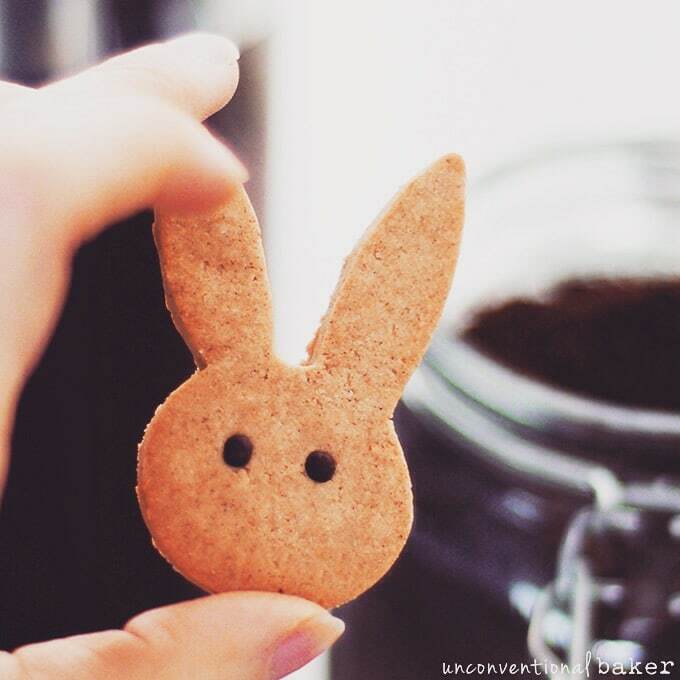 Disclaimer: this post contains affiliate links to the following products: bunny cookie cutters, bunny stamp, bunny stamp & cutter. Dear Audrey! Can I use something instead of guar gum? Will these cookies hold without getting too hard? Keep in air-tight container, or freeze? Thanks! 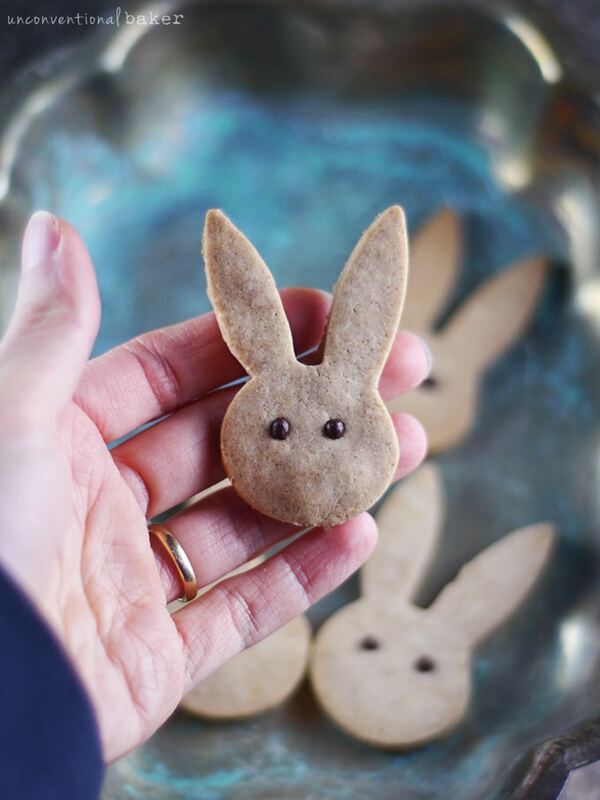 So so so cute : ) I have to make some of these – just as well Easter is later this year, I’m hoping that it will be cool enough to put the oven on…well at least not as hot (Australia). Hi Angela — you’re welcome :) I hope it won’t be too hot by then, though the oven time is relatively short, so that’s some comfort ? I am late to the game, but these look super delicious. Could I substitute the guar gum for xanthan gum? Hi Claudia — absolutely :) You can substitute measure for measure. Oh my my. That looks really good. We can’t get the sweet rice flour here. Is there an alternative? Are tapioca and potato starch interchangeable or do they have different attributes / flavours? Have you tried looking for it by other names? I know in other countries the name “glutinous rice flour” or “mochiko” or just “mochi” are a common name. Sweet sticky rice flour is a very finely ground flour, which helps cut out the grittiness of a lot of gf flours. If you had to bake without it, I would increase the amount of brown rice flour and use some tapioca starch or a mix of starches. 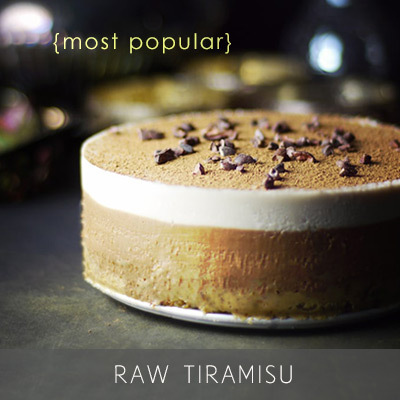 So for this recipe, I’d do something like: 1 cup rice flour and 12 tbsp starch. How cute!!! And I’m sure they’re delicious, too! Thanks Cece! :) Cinnamon cookies are always a nice treat. 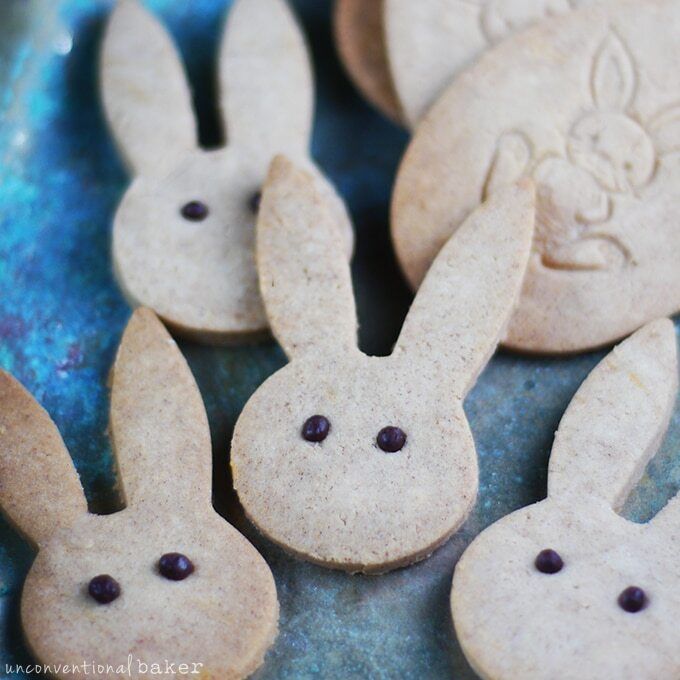 These are the cutest Easter cookies. I’ll have to make them with my girls. Thanks for sharing Audrey! These are too cute! I love the stamp, idea! 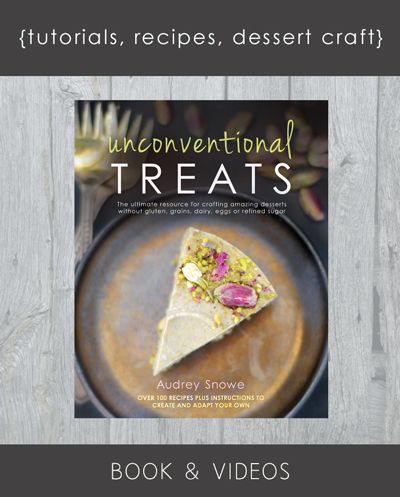 Audrey, I was wondering if I could use 2 kinds of white rice flour (sweet white rice and the regular white rice flour) as I don’t currently have brown rice flour. I have plenty of other flours I could sub in as well like millet, chickpea, buckwheat, coconut, hazelnut, etc. Yes, absolutely, Joanne. 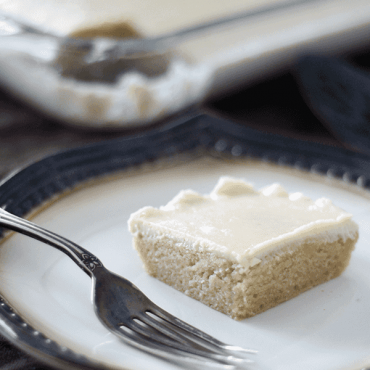 White and brown rice flour can be used interchangeably in this recipe. I’d go with that. Millet could work too — the rest would need some adjusting. But white rice flour would work perfectly well. No worries :) Enjoy the cookies! Okay Audrey these are soooo adorable and so professional looking! 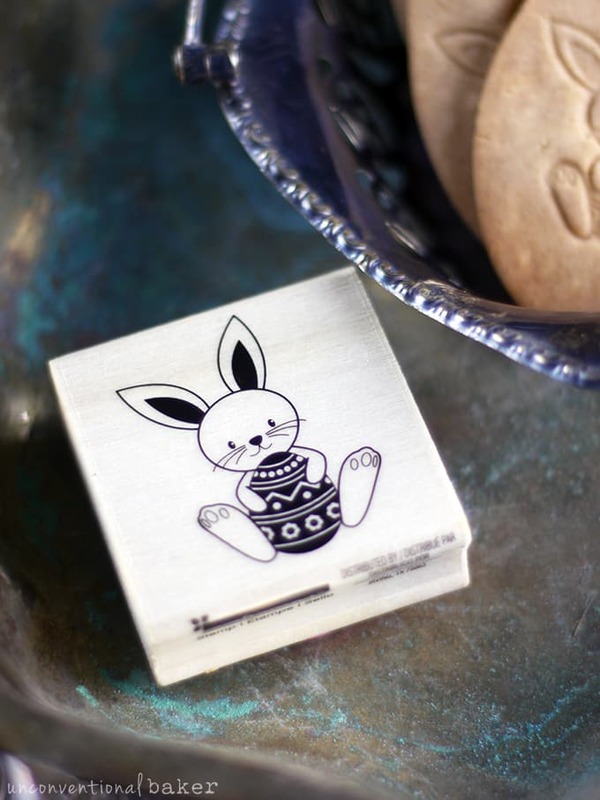 I LOVE the stamp idea….amazing!! I want an entire batch to hoard all to myself, haha. Cinnamon is my absolute favorite flavor, then vanilla, THEN chocolate if you can believe it! Great recipe! I’m super shocked at cinnamon topping vanilla and chocolate! Then again, maybe not — I love it too. It sort of makes EVERYTHING better :) And, by the way, that’s another similarity between you and my husband haha. So adaorable!!! My three old fell in love with these especially the ones peaking up out of the jar! 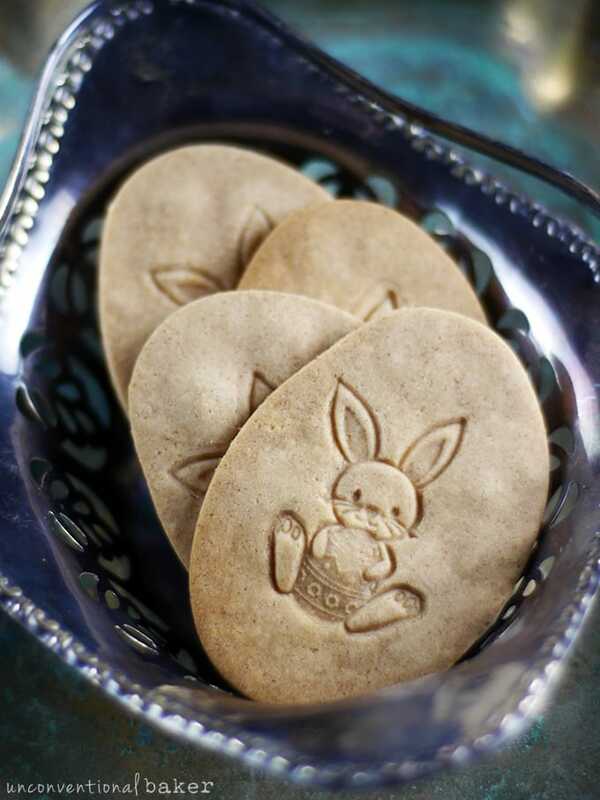 Stamping cookies is a great idea too! Can’t wait to try these. Amaranth balls? I’m intrigued, what and where can I find some? Amaranth balls are just little puffed amaranth grains that are coated with chocolate — that’s what the “eyes” are made of. I love it as a topping on my breakfasts or cakes sometimes. I buy mine at a local health food shop, but they are quite popular — usually in the gluten-free/dairy-free type of section. I’m sure whole foods, Trader Joe’s, etc. carries them, and if not there’s always amazon :). I’ve also bought chocolate coated quinoa puffs before. PS What are amaranth balls? Hehe. I know. I had a good long time admiring each one first. Definitely in the cuteness overload zone. I love all the replies with pictures included :) I don’t think I’ve seen those around here, but they sound like wonderful little things. It kind of reminds me of those m&ms with the rice crispy in the middle that I used to love. I will do some google searching for them, thanks! Damn, they look adorable :D And I can almost feel the taste just by looking at the photos. Perhaps I should make some lovely treats tomorrow, I’ve been craving sweet stuff like mad.